Music groups in Ghana lately have been shaken, some have fallen off, and others have re-ignited: Wutah. Quaking ones like 4X4 are still struggling to figure out what the future holds for them. Notwithstanding the current mishap that have bedeviled groups, Keche is back, championing a new course and blazing the trail when it comes to staying together and still growing as a team while they serve the fans with good music. He added “we have heard international artistes: Victoria Kimani, Uhuru, Mikasa and Yemi Alade, openly saying they will love to do a collaboration with R2Beez but till now that is yet to materialize, we saw only that of Yemi Alade, R2Beez have that power and we feel they are not doing much in putting such huge following and power to use. Sometimes we feel our big brothers, R2Beez are not living up to expectation since they are a group we look up to a lot, learn from and we expect them to be at the top looking at how they started and the talent they have”. During the 2016 edition of the Ghana music Awards, Wizkid announced the signing of R2Beez, Efya and Mr Eazi onto the star boy worldwide label but from what kecke noted, it’s only Mr Eazi who is taking advantage of the opportunity and dominating. “You are repping Ghana, rep hard and come strong” he advised. Meanwhile, Tema based R2Bess over the years have proven to live and act by what the meaning of their name connotes; staying together forever (Refuse to broke) and have over the years tried to be consistent. Even though with no major hit and much visibility. The name R2Beez is still not wiped off form the scene and memory of the music lovers. 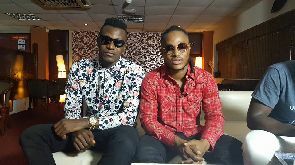 The duo made up of kecke Andrew and Keche Joshua made it known to the host they have been off the scene for a while, learning new things and unlearning the old about the industry and their art but are back with a new single titled next level and promised fans an album to be released by May 2018.